The 2016 vintage at Adelaida was exceptionally good, with very high-quality fruit and slightly above-average yields. The winter rainfall was higher than in the previous four years, budbreak was early, and conditions during fruit set were unremarkable—which is ideal. The summer had a few periods of very warm weather—in June we hit 100 degrees nine times—but that heat created lots of color. July, too, was warm, but it was followed by a beautiful, cool to moderate August, which gave the pigmented varietals time to recover and develop flavors. The 2016 Adelaida Cabernet Sauvignon and Syrah wines combine some of the best attributes of previous vintages: the structure of 2013, the fruit and plushness of 2014, and the savory character of 2015. We began picking Cabernet Sauvignon grapes on September 21st from the old section of our Viking Vineyard. As usual, the grapes were fully ripe, and we fermented them in a combination of wooden vat, wooden barrel, along with concrete and stainless steel tanks. The wine aged for 20 months in 75% new French oak barrels. The Syrah harvest from Anna’s Vineyard began on September 9th. The grapes fermented in concrete and stainless steel tanks. Fermentation took its time—up to 3 weeks—and temperatures peaked at 86 degrees. The wine matured for 18 months in 70% new French oak barrels, hog heads, and puncheons. I try not to get philosophical when it comes to wine, as the point is to enjoy it and not dwell on it in any existential way. But winemaking and grapegrowing are hopelessly bound up with tradition. People have been drinking some version of wine for 8,000 years, so that’s to be expected. But there are numerous reasons to question which traditions are worth heeding and which are best abandoned, and, simply put, the use of cork as a closure for wine bottles has reached its point of usefulness and value at Adelaida. Cork is the outermost bark of an evergreen oak. Horace says that the Romans used cork to stopper their wine vessels, which were likely made of earthenware, but adds that these were then sealed with pitch, as the corks themselves weren’t sufficient. Rocks were also used to stopper earthenware containers. Glass then became the stopper of choice, until the 1600s, when Dom Perignon began using cork because glass itself wasn’t very effective at keeping oxygen out. By the late 1700s, cork had regained favor. It did a better job of keeping oxygen out than anything else available, it allowed a certain amount of oxygen ingress--which may or may not be advantageous for a wine--and it was a renewable product. Two attributes of cork are of primary concern when it comes to wine, especially as it relates to Adelaida wine. The first is the cork’s propensity to deliver into wine a compound called Trichloroanisol, or TCA. This compound, while innocuous to health, makes a wine smell moldy or musty; that is, tainted. Adelaida has been purchasing the most expensive corks on the market and they’ve been guaranteed to be free of cork taint. Unfortunately, we’ve still found bottles that are corked. The cork company has offered to buy back the bottles that are corked, but that doesn’t help out the consumer who opened that bottle up as a special occasion, or who gifted that bottle to a friend. The second challenge with corks is arguably one of its virtues: it’s a natural product, so each one is different. But, that also means that each wine bottled under cork will smell and taste different, too. I’ve been asking myself how I’d feel if my companion and I ordered the same dish at a restaurant but found one being different in quality than the other. It’s just not acceptable. Which brings us to the Diam cork. The Diam is made from natural cork that’s been milled, treated with supercritical carbon dioxide to eliminate all impurities, and formed into a cork shape with a binder. With these new corks we are confident that each bottle of Adelaida wine that you purchase or receive as a gift will smell exactly like it’s supposed to smell, bottle after bottle. The first very wet winter in four years is upon us! This year’s El Niño, caused by elevated surface water temperatures in the South Pacific, is expected to bring about heavy rains and cooler nights. El Niño rains promise a limited replenishment to our water-starved soils…..if we can keep the water from running away! Fortunately, the rains that we’ve had so far have been wonderfully easy, with a handful of daily accumulations totaling not more than 0.9 inches. Since July 1, 2015 we’ve recorded 8.3”, over 2" more than this time last year! What does this mean for the vineyards? Those frequent, light rains allow the soil to slowly absorb the water, which, over time, help to flush out the salts that have accumulated from the prolonged drought. Our concern over heavy downpours at Adelaida is that the steep slopes will simply allow the water to run off, carrying with it our valuable topsoil. To combat this possibility, just before the first rains began to fall we planted lots of peas, beans, white and yellow mustard, daikon radish, and triticale to build up the biomass of our soils. Right now, the vineyards look beautiful with lots of greens and colors, and we know that we’ve done as much as we can to work in stride with Mother Nature. Harvest 2015 is in Full Swing! August 14th marked the first official day of harvest, and as is tradition here at Adelaida Cellars, we toasted to the season with 1984 Adelaida bubbly! An early budbreak coupled with a light cropload spurred an early start and an early end to the 2015 harvest. Our first pick was HMR Chardonnay in mid-August and our final pick was Viking Cabernet Sauvignon on the last day of September. With our commitment to dry-farming, we asked the vines to scavenge for water that had become increasingly scarce during the persistent drought. In July we had a highly unusual deluge that brought a second-wind to the vineyards just as they were entering the critical growth period where color, sugar and phenolics all assemble inside the berries. This hydration event sustained the optimal development of our clusters and led to a classic season. There were a few typical heat waves in September and the vines responded well, likely because they've become used to such conditions. We’re very excited about the concentration of flavors and the high acid in the fruit and must, which promises delicious wines and liveliness. Many of the wines have already been barreled down, and Cabernet Sauvignon is continuing to ferment in oak and concrete tanks. We expect great wines from the 2015 vintage and can't wait to share them with you. Look for the 2015 whites in about a year and the 2015 reds in 2017. The 2013 harvest was the earliest on record for Adelaida due to low winter rainfall and steady warmth throughout the growing season. Total yields were about average and quality was excellent. At this early stage, with most of the wines still completing their secondary fermentation in barrel, the reds are deeply colored and the whites are showing great richness and vibrancy. This year was our first farming organically. The dry conditions allowed us to limit the number of passes we made in the vineyard to control fungi, and, even with those drought conditions, we severely limited irrigation to occasions where the plants would have suffered without it. On August 19 we picked the first fruit of 2013: A small amount of Chardonnay, Pinot noir from 6 rows in the northeastern part of our HMR vineyard, and syrah from our Viking vineyard. Simply put, the fruit was ready to come off the vine. By way of contrast, and as a demonstration of the effect of temperature on harvest date, in the cool 2011 vintage, we picked the first Chardonnay on September 19, the first HMR Pinot noir on September 23, and the Viking syrah on September 21. Our final pick of 2013 was muscat for our dessert program from Bobcat vineyard on November 11. We made two passes in the muscat, the first being clean fruit with high sugar and relatively more acid (31 brix) and the second with a little botrytis (at 33 brix). The botrytis infection was limited because of dry growing conditions, and we hope to see more in 2014. We brought in significantly less zinfandel and cabernet sauvignon in 2013, much to our disappointment. 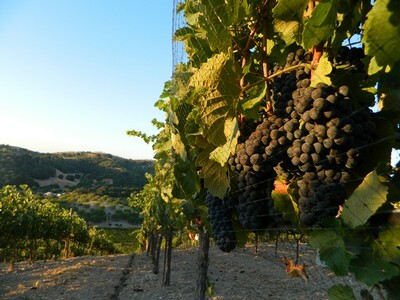 The cabernet berries, in particular, were very tiny, and the Viking vineyard, which was planted in 1991, showed its age by not producing as much fruit. But what that vineyard lacked in fruit quantity it made up for in quality. 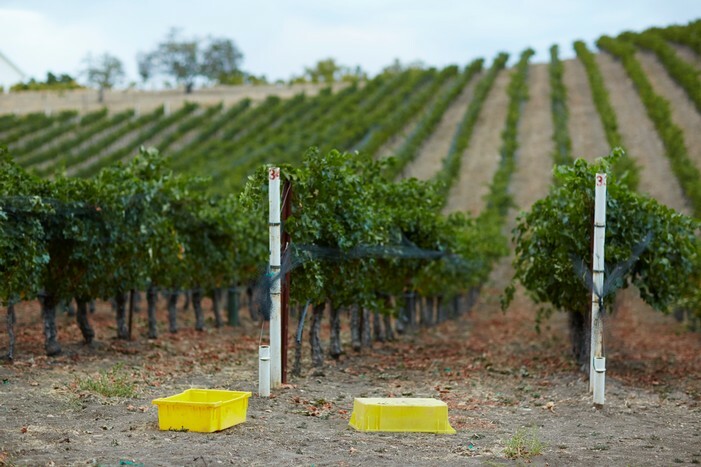 The zinfandel vines from Michael’s block, named after our stellar ranch manager Michael Whitener, bore the combined effects of drought conditions and dry farming. The fruit struggled to reach its typical sugar levels, and we made several surgical passes throughout the growing season to balance the amount of fruit with the vine’s ability to ripen it. We’re happy that we did, as the wines so far show great finesse and spice. In between the first and final picks, we saw much to admire in 2013. The red berries had thick skins, which they synthesized as a result of several environmental and cultural factors, including sunlight, temperature, shoot positioning and low rainfall. The resulting wines have great color and extraordinary tannin. The whites grapes benefited from cool nights, which helped retain their acidity, and careful farming, which kept leaf cover over the fruit to minimize sun damage. 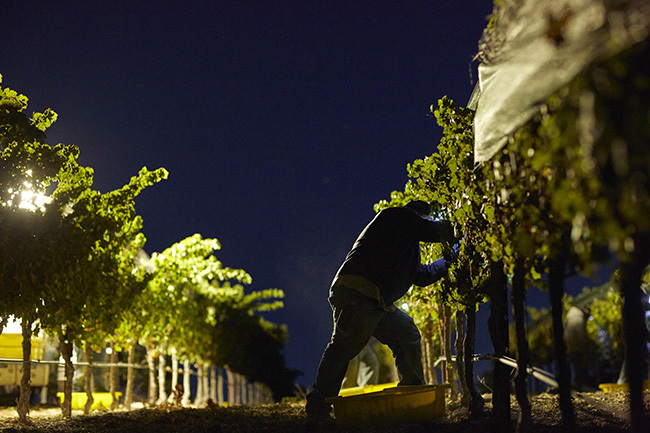 Our switch to night harvesting in 2013 kept the fruit nice and cool when it arrived at the winery. As of June 28, a high pressure system has settled on the entire West Coast, and weather experts are forecasting several days of high heat and possibly record-breaking temperatures. With that projection in mind, and with seeds beginning to harden and veraison on the near horizon, we decided to give the plants some water. While we employ a technique known as deficit irrigation to control shoot growth and increase grape quality, we want to keep the plants alive. Over the next several days we’ll continue to feed the plants enough water to counterbalance evaporative losses. These early-season high temps are preferable to those that occur late in the season, as the intense heat induces the green grapes to make sunscreen in the skins, which will provide protection throughout the summer. When the heat recedes we’ll finish our cluster thinning pass, which we began several weeks ago. This involves culling excessive clusters and those on weak shoots with an aim to balance the fruit load to the age of the vine, its size, the size of the canopy, and the size of the shoots. With the strong belief that the best wines come from the best fruit, we have begun making a series of major investments in all of our vineyards (HMR, Anna’s, Viking, Michael’s and our newly planted vineyard.) Our two key goals are that every bottle of Adelaida wine represents our vineyards and that our farming practices ensure the long-term vitality of the vineyards. For starters, we are doing away with herbicides. While convenient, cheap, and certainly effective in the short term, herbicides are unnecessary at best and at worst they disturb the natural habitat of beneficial insects, among other things. To combat weeds, we have purchased a cultivator that cuts weeds in the vine rows without harming the plants. Next, we are looking to build up the soil health by choosing cover crops that match each ranch and each soil type within each ranch. The cover crops will provide nutrients, erosion resistance, and a home for beneficial insects. As part of this program we will introduce organic compost into the vineyard in the winter. We are taking a closer look at vine nutrition. As the saying goes--and with some caveats--struggling vines make great wine. This adage has its limits, of course. We don’t want to kill the vines, but we also don’t want them fat and happy. So, we will be measuring the vines’ uptake of nutrients at critical points during the growing season—bloom and veraison—to determine whether they require supplemental micronutrients. And we will also be measuring how much water the vines are seeing by using a pressure bomb. 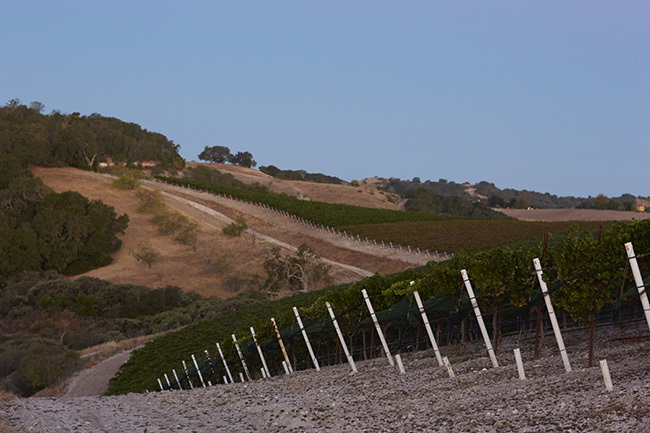 In the spring of 2013 we planted 23 acres of new vines comprising Zinfandel, Alicante Bouchet, Grenache and Carignan. They are on a steep hillside facing south. We will head-train these plants—that is, they will grow up without a trellis-- and we will farm this area without irrigation. Finally, we have retained Daniel Fischl of Eartrumpet Consulting to help guide us to reach our goals. 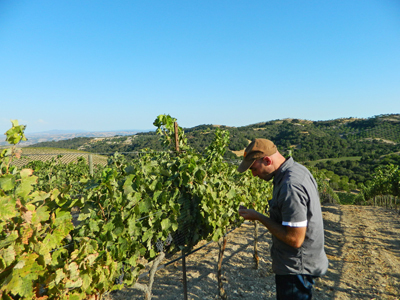 Daniel is an experienced viticulturist with clients in Australia, China, Italy, Israel and Napa. His current and former clients include Screaming Eagle, Harlan, Bond, Aubert, Peter Michael, and David Abreu. 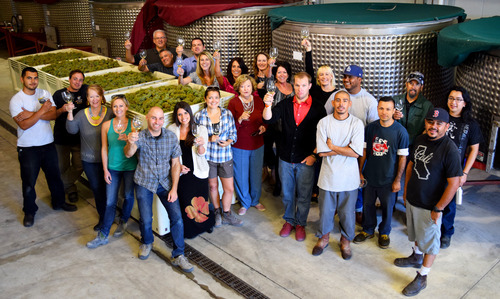 We’re excited about the way the 2012 wines are developing. While their baby fat is still very much present, the wines reflect in their underlying richness and precision the nearly perfect growing season of the vintage. Not only did warm temperatures return after two consecutively cool years, but yields were up, too. Rainfall between November and April (when the bulk of the annual precipitation occurs) was slight, especially in contrast to the previous two years, but not critically so, and there was rain into May. We saw budbreak first in our Upper West Block of Pinot noir, followed closely by Syrah and Grenache in Anna’s Vineyard. Budbreak finished in the Lower Viking vineyard with Cabernet Sauvignon. From the end of May into June daytime temperatures were in the 80s and 90s, with occasional spells of heat, which led to even and successful flowering. July temperatures were unusually erratic, with some days in the 70s followed by days that eclipsed 100. Fortunately, the nights were largely cool, which allowed the vines to recover. The return of seasonably warm days (compared to 2010 and 2011) snapped veraison—the period when the skins soften, sugars accumulate and, in the case of red varietals, color pigments known as anthocyanins are synthesized-- back to its normal schedule. The heat continued into August, in which we recorded two weeks over 100, but our top-notch vineyard crew stayed on top of thing and metered out enough water to keep the plants transpiring. September was virtually perfect, with warm days and cool nights and only a handful of hot days. On August 29 we harvested Syrah from Viking Ranch vineyard as our first pick of the year off the estate. 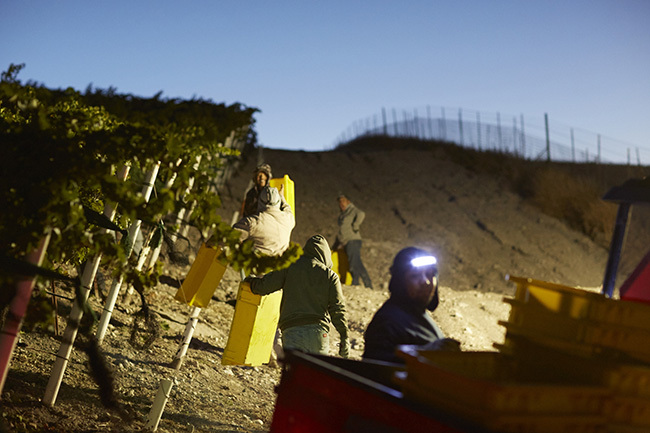 From that point on, the action was non-stop for six weeks, as the vineyard and production crews worked tirelessly to bring in fruit at its optimum and process it in time for the next pick. By the time we finished our last estate pick—Picpoul blanc, on October 18—and our last off-site pick—Carignane from Camp 4 in Santa Ynez Valley--we were exhausted but also elated by the vintage’s prospects.